1 - Stridex Pads (@ $4.49) will submit for $3.50 rebate = $.99 after rebate! 1 - Orajel Kids Mouth Wash (@ $3.00) - will be free after rebate! 1 - Complete (@ $7.99)- will be free after rebate! 6 - Assorted Hershey's candies (@ $.88, B1G1 Free) used three B1G1 free coupons = FREE! 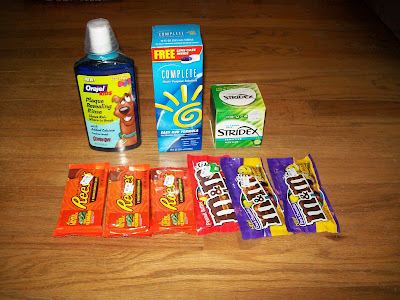 Total: $15.48 (+tax) on Rite Aid Prescription gift card! Will receive $14.49 back for Single Check Rebate! They didn't have the remote/headphones... I may try another store. Had a pretty good trip today, stopped at two local stores for some goodies!